FOR 150 years, The Gympie Times has seen the region wrapped in black and white - and now colourful collection of news and images. 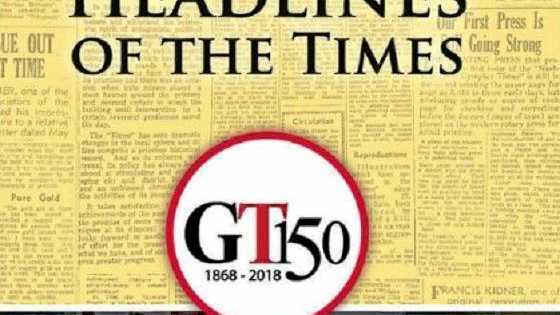 This special edition will be distributed to the wider community in October and showcases the history of the times from its formation in 1868. As we celebrate a century and a half, we pay tribute to the small group of printers and businessmen who struggled through the unexplored and un-cleared Queensland bush from Ipswich, loaded to the hilt with expensive and heavy printing equipment, to the booming goldfield of Nashville. After securing enough advertising to pay for the first edition, those hardy newspapermen set about finding the newsprint and hand setting the type only to have the fickle Mary River burst its banks and their "high and dry” printery inundated with flood water. But like all good newspapermen they soldiered on and printed their first edition of the Nashville Times and Mary River Mining Gazette on February 15, 1868. By the 1920s, The Gympie Times became a paper in its own right, servicing a thriving community bolstered by butter production and the railways that were opening up in Queensland. General manager Tracey McKean said a lot of positive changes had taken place since shed started back in 1986. "I've seen many changes to the way a newspaper is produced and worked with many wonderful people along the way,” Mrs McKean said. The Gympie Times became part of the News Corp family last year. "We love sharing information from across our beautiful region, stretching from the Mary Valley and Goomeri in the west to the Tin Can Bay and Rainbow Beach coastline,” she said. Don't miss your edition of GT150 at local newsagents from October.